THREE PIECES OF (OUR PART NUMBER #75-VB-CPM), THE CYLINDRICAL POST MOUNTED VEE BLOCK. SEE PAGE 19 OF OUR KINEMATIC CATALOG 105A FOR DESIGN DETAILS. THREE PIECES OF (OUR PART NUMBER 75-270-CH), WHICH IS THE THREE QUARTER INCH DIAMETER KINEMATIC SPHERE WITH A .270-INCH (6.86 MM) DIAMETER CENTER HOLE. SEE ADDENDUM TO CATALOG 105A. 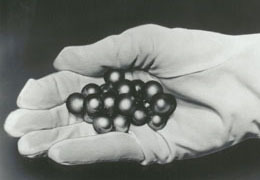 THREE SETS OF (OUR PART NUMBER 75-ST-270), THE THREE-QUARTER INCH (19 MM) DIAMETER SPHERICAL TILT. THREE PIECES OF OUR ONE-QUARTER INCH (6.35 MM) BY 20 CONTINUOUS THREADED STOCK THAT ARE 9 INCHES (229 MM) LONG. YOU CAN CUT THESE EXTRA LONG PIECES TO THE DESIRED LENGTH WHEN YOU MAKE THE ASSEMBLY. THREE PIECES OF ONE-QUARTER INCH (6.35 MM) BY 20 THREADS PER INCH HEAVY DUTY HEX NUTS. THREE PIECES OF HEAVY DUTY MACHINE WASHERS, ONE INCH (25.4 MM) O.D. BY ONE-QUARTER INCH (6.35 MM) I.D. THREE PIECES OF A ONE-INCH (25.4 MM) DIAMETER KNURLED CLOCKING NUT (OUR PART NUMBER 250-20-CN) INCLUDING THE BALL THRUST BEARING, A WASHER AND A WING NUT. 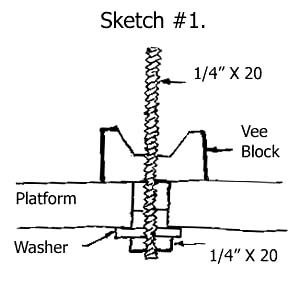 THREE PIECES OF SCREWDRIVER SLOT-ONE QUARTER INCH (6.3 MM) BY 20 FLAT HEAD SCREWS BY THREE QUARTER INCH (19 MM) LONG THAT ARE USED IF THE ALTERNATIVE METHOD (SHOWN IN SKETCH #2) IS USED TO CLAMP THE VEE BLOCK TO THE LOWER PLATFORM.